Smooth and re-energise your eyes with Institut Esthederm's Eye Contour Lift Patches, a high performance solution designed to help banish signs of ageing and fatigue around the delicate eye area, including fine lines, wrinkles and dark circles. 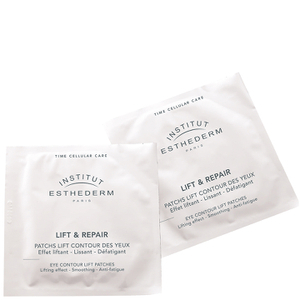 Infused with stimulating Caffeine, Escin and Repair technology, the patches improve skin’s radiance for brighter, more youthful-looking eyes, and expertly ease signs of tiredness and stress such as under eye bags, dark shadows, puffiness and discolouration. Their dose of Lift technology works to plump, smooth and tone the eye contour's appearance, leaving you with firmer, younger-looking, revitalised peepers. Perfect as a month-long treatment or emergency eye care boost throughout the year. Suitable for mature and dehydrated skin types. On cleansed and dry skin, apply a patch under each eye up to the crow's feet. Smooth lightly with your finger so that it sticks to the skin. Leave for 5 minutes, remove the patches and rub the excess. Do not rinse. Do not reuse. Frequency of use: in a 6 weeks cure (2 to 3 times per week) or as a punctual emergency treatment.